Remember the first time you had corn on the cob this summer? . . . and, how special it was? . . . and, how much you ate? The corn was so sweet and tender. Back then, I’d buy a half-dozen ears at the farmer’s market – and my husband and I could easily polish it off at one meal. Now, as the season winds down, I’m getting a little tired of corn. So when a neighbor gave me ten ears of corn a few days ago, I was looking for ways to use it. And, then I remembered Corn Fritters. . . I found an incredible recipe for Corn Fritters in a hundred-year-old cookbook. The Fritters were crispy on the outside and contained just the right amount of corn. The recipe was perfect – it was both easy to make and tasty. Bring on the corn! Put flour, salt, red pepper, egg, milk, and olive oil in a mixing bowl; beat until combined. Add corn and stir until the corn is evenly distributed throughout the batter. Heat 1/2 inch of shortening until hot in large frying pan. Drop spoonfuls of batter into hot shortening. 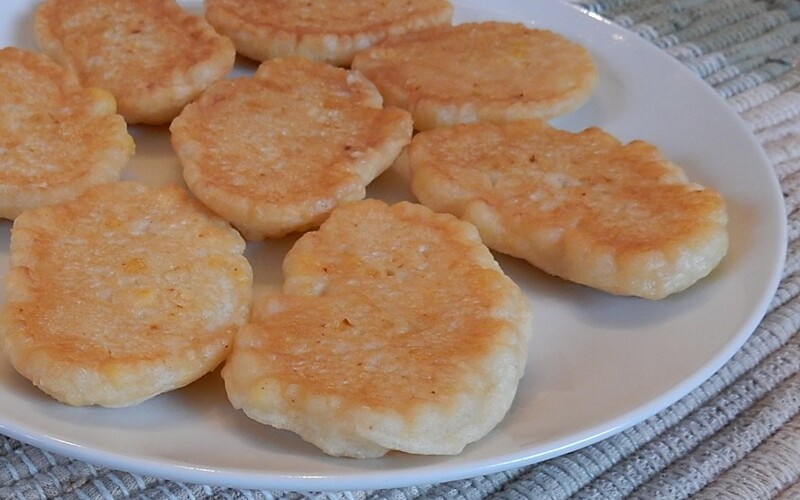 Flip fritters and fry until golden brown on both sides. Remove from heat and drain on paper towels. Serve immediately. Cook’s note: The original recipe called for 2 teaspoons salt. This seemed like a lot to me, so when I updated the recipe I only used 1 teaspoon. Posted on September 10, 2017 September 9, 2017 by SherylPosted in FoodTagged corn. That brings back memories! We also used to buy corn cakes (as we called them) at The Market House in Williamsport. It is hard to get good corn here and nothing compares to PA corn. When we go up to PA in the summer, we eat it everyday. The Market House was just an important part of Williamsport back in the day. Thanks for reminding me of it. I went on Saturdays with my grandparents. They seemed to know all the vendors and it is a memory I cherish. Yum! Did you use any kind of sauce with them? I do a similar one with rice fritters and the kids like ketchup with them – very American. No, I didn’t use any sauce – though I have memories of putting maple syrup (or Karo – which makes me cringe now) on corn fritters when I was a child. I miss sweet corn. Allergic to corn now. Wonderful recipe you shared. My husband will like it. I haven’t had one bite of corn all this summer. I have no idea why. We’re well past our sweet corn season now, but I’m tucking this into the files for next year. This looks rather like the fried sweet corn I had in a restaurant. It was delicious, but now, even though I remember the food and who I was with, I can’t remember which state we were in. Goodness! I’m not surprised that you can’t remember the state. I often find that one travel memory blends with the next over time. DingDingDing! It was Paola, Kansas, during my long trip last fall. It kept bugging me, so I called my aunt (who was one of my dinner companions that night) and she knew right away. She always remembers the good food. The first time I made corn fritters was from the American Girl cookbook from when American Girl dolls were just Kirsten, Molly, and Samantha. They were in the Samantha section. I’ve made them several times since. One thing to note, fry carefully. Fresh corn has a high water content and can pop and splatter. Agreed – it’s always important to use care when frying. My Dad made these when we were little, and it’s still a treat when we make them. Our family uses creamed corn and has Karo syrup on them. I didn’t put any syrup on the corn fritters that I made – but I have good memories of eating corn fritters with Karo when I was a child. This sounds so incredibly good. Oh gosh! They look so good! I think your husband is lucky. Yum…I love corn fritters. I’m going to make these. Thanks for the recipe. I really like this recipe. It was both tasty and easy to make. Omgosh! 2 teaspoons salt! Woe! Your adjusted recipe looks and sounds delicious. 2 teaspoons of salt had to have been a typo. I can’t even imagine how they would have tasted with that much salt – but I’m sure it won’t have been good. One of the really nice things about food is how food memories can be shared across generations.